Along the Cooks River near Steel Park in Sydney’s inner west there is an abundance of litter available to engineer sailing craft to fit any brief. 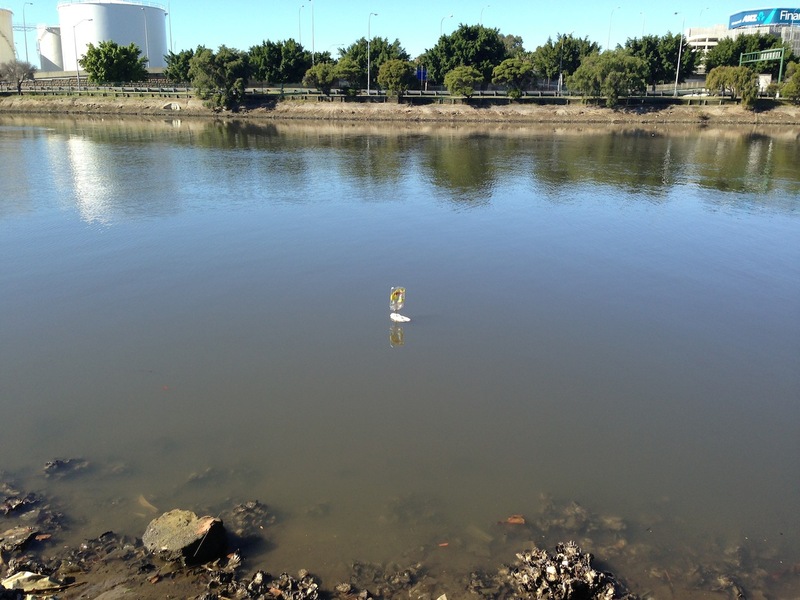 This simple skimmer was literally thrown together in 10 minutes and sailed happily out into the river and set of towards the airport and Botany Bay. A simple well-balanced boat employing a sand and water filled bottle as ballast and hull. A wind rudder (the white foam) is situated over the bow area to assist in pushing her straight. Apart from this there was a wide plywood deck and some bits of a paddle ski (or something?) that gave her some interesting ‘skimming’ qualities as she moved over the water. With most of the hull sailing below the waterline this was pretty much a sailing submarine. This would have to be the biggest flotsam boat created to date. And not the prettiest as if that were ever an objective. The first launch was off a rocky point where the fishermen are. But it kept getting caught in some sort of eddy from the exiting Cooks River and messing with the fishing lines. Fearing being stabbed in the eye and gutted by a fisherman I moved over to the beach for a second launch. Where she happily pushed out into the bay and the gloomy horizon of the day for these fantastic shots. There was not going to be any tacking this day with an on shore wind into a horseshoe beach. But not worried about this minor detail and fighting off the sense of futility I commenced to put this tall ship together. I gave it a few test sail of the rocks. But not able to send it out I turned it over to these two fellas who seemed surprisingly interested to push it around while swimming. This was the second boat on the Cooks River on this day and was even more satisfying than the first. By setting the rudder to about 1130 and adding an extended sail from the starboard I was able to get this quickly produced vessel of scrounged rubbish to actually tack across the wind. The extended sail kept swinging the bow out away from shore with a burst of inertia sustained by the weight of the keel that pushed out across the wind each time. I launched a Styrofoam boat from the shore into an onshore wind and got it to tack its way down the coast even gaining against the wind as it went until further along it was well of the shore. Boat ‘34’ took about 5 minutes to scrounge the bits along the shore of the Cooks River and push it together. The river was flowing swiftly but in the opposite direction to a stiff breeze running just off the side I was on. The result was the hypnotizing slow motion effect of the boat not just running bow against the current but holding almost dead level! Though pointing up river the boat very slightly moved away from the shore and ultimately crossed the river sailing against the current and moving slowly side wards. It looks as though it is stationary until you see the debris in the water shooting from bow to stern and the wake ripple coming of the stern. If you watch the movie take special note of my sons excitement regarding my achievement.